Great Offer To Rent For Holidays On Mazatlan ! 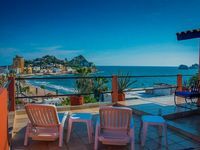 Property 12: Great Offer To Rent For Holidays On Mazatlan ! Property 16: Walk to the beach, malecon and Plaza Machado! Property 27: Two Blocks- Ocean & Malecon. Beutiful house very well located, spacius and safe. Property 43: Beutiful house very well located, spacius and safe. We stayed at the casa for Spring Break with three kids. We had plenty of space to spread out. The music from the bars nearby was very loud and late on Friday and Saturday. Bring ear plugs. We rented through Mazatlan4rent and had excellent service; airport pick-up, food stocking, and excursions. Overall the location and house are excellent for families. The beach is a 2 minute walk and was one of the nicest, cleanest and quietest we found. There are so many restaurants you can walk too. We always felt safe. There's always a pulmonia taxi around if you don't want to walk Things to improve: The showers need updating. It could use a fresh set of towels. They should stock the water jug. They could provide beach chairs and umbrellas. The only draw back is there is no pool for easy swimming with kids. But other than that this place is perfect for families.